For many years, BC’s health care system escaped the austerity imposed on other parts of the public sector. No longer. While total dollars allocated to health care are still increasing somewhat, those increases are not sufficient to keep up with cost drivers in the system, leading to a real reduction in health care services. This needs to be rectified in February’s budget. Let’s unpack that a bit. There are three main cost drivers in the public health care system, which together mean that total funding needs to grow by a certain amount each year for the system to provide the same level of services per British Columbian. The first is inflation. Just as people need wage increases to keep up with a cost of living that goes up over time, the same is true of health care. Public funds allocated to health care need to accommodate rising costs, mostly the wages and salaries paid to health care professionals, but also the operating costs of hospitals and offices, equipment and so forth. The second cost driver is population growth. 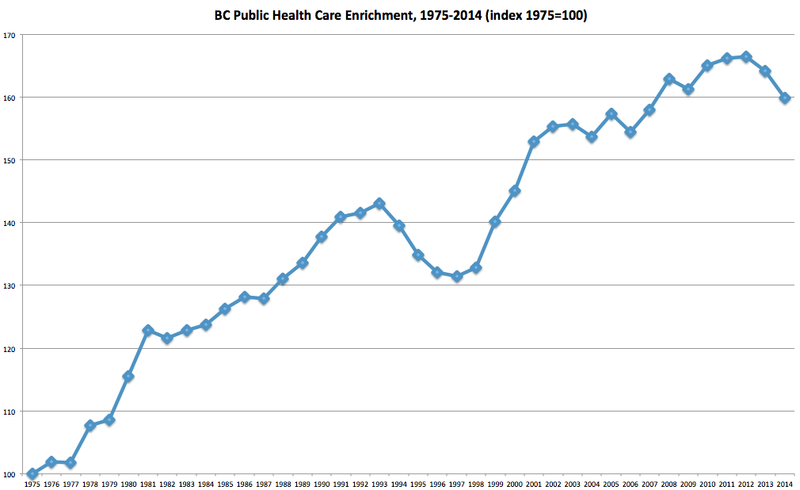 If BC’s population doubles, we should expect health care costs to roughly double. For economists, adjustments for inflation and population growth are standard practice to ensure we are comparing apples to apples from one year to the next. Population growth and inflation are typically accompanied by proportionate growth in the economy so there is only reason to be concerned if they are accompanied by a massive increase in unemployment. The third cost driver is demographic: the aging of the population. Average health care costs per person rise with age, from a low of about $1,500 per person per year for children age 1 to 14, to a high of more than $21,000 per person per year for those age 90 and over (in 2012). Senior British Columbians (over age 65) amounted to 16% of the population in 2012, but used 41% of public health care dollars. As BC’s population gets greyer, this has led to some concern about the sustainability of public health care. This is generally misplaced: population aging is a cost driver but a relatively small one, with increases of less than 1% per year needed to accommodate the shift. Far from a silver tsunami, population aging is a slow, rising tide that can be managed in the context of a growing economy. The share of seniors in the population is anticipated to stabilize at just under 25% in the 2030s. Altogether, over the next decade health care expenditures must increase by 4.2% each year in order to compensate for estimated population growth and aging, and inflation. Historically, BC’s economy (nominal GDP) has grown by much more. Even over the past decade, which includes the Great Recession, economic growth averaged 4.5% per year. If this rate of economic growth was to continue, BC has the capacity to cover those annual cost drivers, and thus continue to afford the health care system we have. The good news is that the typical British Columbian gets way more health care services – about 60% more – than four decades years ago. Over time, BC has been providing more health care services per person, representing improvements and advances in surgical procedures, prescription drugs, long-term care, home care and so forth. The dip in the mid-1990s is related to a previous era of austerity, but by the late 1990s (thanks to a new federal-provincial health accord) that was corrected and then some. The current challenge can be seen in the last two years, 2013 and 2014, with a real drop in health care services per British Columbian. That may seem minor in the context of the whole 40 year period, but the downwards pattern is set to continue. BC Budget 2015 increased health care spending by 2.8%, less than needed to cover cost drivers, and the baseline increase for the following two years is similar. BC Budget 2016 needs to fix this problem, and ensure that at a minimum we are keeping up with those cost drivers. The new government in Ottawa has promised a renewed health care accord, and that should ease some of the pressure on the provincial government. But it is the BC government that must break with its austerity policies, or we will see more erosion of public health care services.